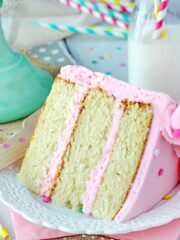 I am so excited to share this recipe for a Moist and Fluffy Vanilla Cake with you today! It’s a cake I’ve been making for years, but wanted to tweak and it’s finally ready! So let’s talk a little about this recipe. You may or may not have seen/made my vanilla cupcakes. They have been quite popular and it’s a recipe I go back to time and time again. I love it and so many others love it too. But it always amazes me how people love different things about cakes. Many people have agreed that they are perfect, moist and fluffy and it’s their new favorite. Yet some think they are too dense. To be fair, when you bake it as a cake, it is fairly dense. And yet, every time I do a taste comparison with a larger group (usually our church group), it’s their favorite – whether a cake or cupcakes. Funny, right? But I am someone who likes options. I don’t want to feel limited and I’m sure I’m not the only one. And since I’ve loved this cake for so long, I decided it was time to share it so you could have more options. 🙂 The only reason I haven’t shared it sooner is that I wanted to tweak a few things. One thing being that the original recipe didn’t do well as cupcakes. They separated from the liners as they cooled, so I wanted to fix that (and I did!). Of course, now it begs the question of how this recipe is different from the other one. Neither is necessarily better than the other. That really depends on your preference. But any time I see multiple options for a particular flavor (like vanilla) on someone’s site, I’m always curious about the differences so I know which one I want to try. So I want to break down some of the differences and similarities for you. First, let’s talk about the ingredients. Just like with the other recipe, I wanted to have simple ingredients that most people usually have on hand. The original recipe calls for cake flour and I wanted to replace that with all purpose flour. That, plus some other tweaks to account for the change, and you now have a pretty normal ingredient list. Score! Second, there’s the mixing method. The other recipe is very simple. Basically a throw everything together and mix method, which is wonderfully easy. This cake uses the creaming method. The steps are more involved and definitely need to be followed. Third is the final cake taste and texture. Again, this is very subjective in terms of which is better. I love them both. They both have excellent vanilla flavor. This cake is flatter on top when baked. As for which is denser, or fluffier, I think they’re both fluffy and dense. Confusing, right? This cake manages to be a little denser-seeming, as there aren’t as many air pockets in the baked cake. But when you bite into it, it actually has a super fluffy taste and feel to it. I feel like the other recipe is actually the denser one, especially when made as a cake, but it has more air pockets and also manages to seem fluffy. Both are very moist. Personally, I like the other recipe for cupcakes (they’re still my perfect cupcake!) and this one for a cake. But both can be used as a cake or cupcakes and both are delicious. The bottom line is that you can’t go wrong with either, though you might end up preferring one over the other if you try them both. I love the texture of this cake. It is absolutely wonderful when layered and iced and I find it very hard to not want to eat the entire cake. It really is a very soft and moist cake. I recently shared it with a friend who wanted to make a vanilla cake for her daughter’s birthday and they loved it! This is a cake I’ve been making for years, but wanted to tweak and it’s finally ready! 2. Beat the butter and sugar in a large bowl on medium speed about 2 minutes, until light and fluffy. Scrape down the sides of the bowl. 3. Add the egg whites and vanilla and beat on medium speed for about 1 minute, no more. The texture of the batter will change and become thicker and may seem a little curdled. 4. Combine the flour, baking soda and baking powder in a medium sized bowl. 6. Add about half of the milk and beat on medium speed until incorporated. 7. Continue alternating adding dry and wet ingredients, scraping down the sides of the bowl as needed, and beating until incorporated after each addition. There should be three total additions of dry ingredients and two total additions of milk. End with the dry ingredients. The batter will be thick and glossy. 8. Divide the batter evenly between the cake pans and spread evenly. 9. Stagger the cake layers on the oven racks so that no layer is directly over another. Bake for 30-33 minutes, or until a toothpick inserted into the middle of the cakes comes out clean. Don’t be alarmed if the tops are a little browned, that is normal. 10. Remove cakes from oven and allow to cool for 3-5 minutes. 11. Remove cakes from pans to cooling racks and cool completely before frosting. 12. To make icing, combine butter and shortening and mix until smooth. 13. Add 6 cups of powdered sugar and mix until smooth. 14. Add vanilla extract and 4 tbsp of water or milk and mix until smooth. 15. Add remaining powdered sugar and mix until smooth. 16. Add more water or milk until desired consistency is reached. 17. To assemble cake, place first layer of cake on your cake stand or plate. NOTE: The cake layers shouldn’t have a rounded dome on top of them, but if they do, cut them off before stacking. 18. Add about 1 1/2 cups icing and spread into an even layer. 19. Add second layer of cake and another 1 1/2 cups of icing. 20. Top cake with remaining layer of cake. 21. Use the rest of the icing to ice the outside of the cake. For instructions on icing a smooth cake and the piping, here is a tutorial. Follow instructions above through number 7. Fill cupcake liners about 1/2 way. Bake at 350 degrees for about 16-18 minutes. Allow to cool in pan for 2-3 minutes, then remove to cooling rack to cool completely. Recipe makes about 36 cupcakes. Recipe modified from this recipe. Hiiii Lindsay, I recently came across your blog and I’m very glad that I did!!!! You blog is as beautiful as you. You have wonderful recipes. I’m kinda new into baking and I see there’s lot to learn from you. I immediately subscribe to your website the minute I saw it. Its very clean, neat and peaceful. Thumbs up for that. I always get pleasant vibes after looking at your blog. Thank you so much and I’m definitely going to try this vanilla cake this week!!!! God bless you. I’m so glad you found the blog too! Thanks for signing up for emails! Just let me know if you have any questions about recipes. Enjoy! Yes, just egg whites. This cake won’t work as well with full eggs. Just tried this cake and tasted like cornbread what did I do wrong ? I bake quite often and i decided to try your recipe. I followed your steps and instructions exactly as they were said on your page. I used all the correct measurements for the batter, and even though I did this, the cake came out extremely watery. What did I do wrong? HI Lindsay! I had a question, it says in the recipe to line 3-8 inch pans, however what if I only need two 6 inch cakes so i can cut them, then layer them and stack them to make it a layered cake but more than three layers…..Will the batter be too much to place them in 2 6 inch pans? I don’t really make any 6 inch cakes so it’s hard for me to say. It probably depends a bit on how thick you want the cakes, but I’d imagine you won’t need all the batter. I don’t think I’ve ever tried it, but I’m pretty sure others have and it was fine. Hi!! Is there a simple way that I can turn this into chocolate cake? It would be hard for me to say for sure without trying it. If you’d like to try a chocolate cake though, I have this one that I love! Hi lifeloveandsugar I haven’t made your cake yet but I am going to today. I was wondering how big the cake ya and also why there is so much butter.Aldi why do you use salted butter instead if unsalted? Hope you enjoy the rest of your day/ or evening!???? It’s an 8 inch cake. I used salted butter by choice, rather than add my own salt. But you could use unsalted and add your own salt. My cake came out runny and taste like corn bread I made the batter twice and made sure my batter was as the instructions told me so. And still came out the same !!!!! I see other ppl had this problem but you are not answering them on how this could of happen ?!? Avelaka – It is nearly impossible for me to know exactly why someone doesn’t get the correct result. There are so many factors. Did someone mis-measure something and not realize it? Did they mix it incorrectly? Had an ingredient gone bad? Is it the oven, altitude? SO many things. I can make possible suggestions, but I simply don’t know. Why would your cake be runny? The only thing I can think of is that it’s under baked. You want to be sure to test cakes with a toothpick before removing them from the oven so you know they are cooked through. I have made this cake dozens of times without having the result you describe. I know the recipe works. For any comment where someone was unsuccessful, there are more where people were successful. I’m sorry it didn’t work for you, but I don’t know why that is. I am also new in cake baking and I totally share your centiments… also that I prefer dense. This cake looks amazing. Can u only use butter for the icing rather then the shortening. Can I double the butter amount for the buttercream I mean? I also wanted to know I only have 2 8inch cake pans can I wait until I bake 2 cakes and bake the remaining when I finish with pans? Thank you in advance. Yes, you can use all butter in the frosting and bake the cake layers separately. Hi this looks like a good recipie i was going to use to use it to make a rainbow cake for my best friend. Do u think the layers would hold well? Also is this a dense cake? What can be used in place of shortening when baking a cake?? I’ve been on a similar quest with the perfect chocolate cake, and the crazy thing is, I think my favorite chocolate cake has no gluten! 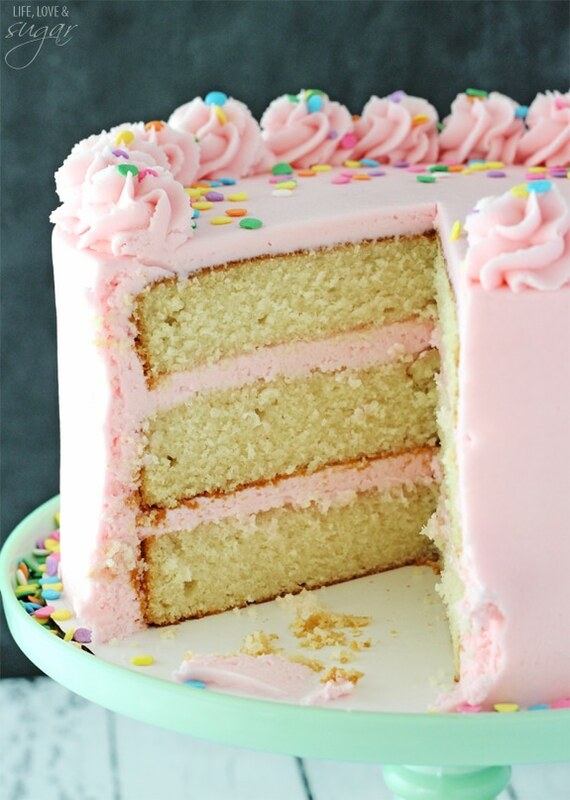 This looks like the fluffiest vanilla cake ever. So beautiful! Can you share the recipe as I’ve been looking for the perfect gf chocolate cake. I’m planning on adapting this recipe to make gluten free. You are quite a cake expert!! Pinning this dessert for later. It’s gorgeous and I bet delicious too. Yes, it should stay fresh for at least a couple of days. Would you recommend refrigerating it, if you bake it the day before? That depends on if you make changes/adjustments. When I use half butter/half shortening, I don’t refrigerate. If you use all butter, I would. I LOVED this recipe, but do have a question regarding the icing. What kind of shortening do you use? I felt it tasted / felt like shortening if that makes sense. Everyone else seemed to like it, but I felt it was off. Although it could have just been knowing the ingredients. I’m glad you enjoyed them Rachel! I use vegetable shortening. I didn’t like the icing at all. Neither did anyone else that ate it, to a person they said they could really taste the shortning. It’s the first time I’ve ever seen shortening in an icing recipe and I almost thought it had to be a misprint. I’ll definitely use a different icing recipe or swap for all butter. The cake is really good! We do find it to be quite dense, feels more like a pound cake. Last time I made it I put an awesome lemon buttercream on it and it was a HUGE hit!! I loved this cake! I wanted to make it as a 13 X 9. Would you be able to tell me if you think that will work and how the bake time might change on it? Thanks! I haven’t made it as a 13X9 before, but I think it will work. I’m not sure about the bake time though. 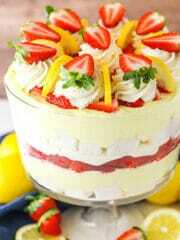 I making this cake today can I use 3 X 9 X 2 inch please let me know a.s.a.p. Do you mean a 9×13? Not a 9×3? If so, I believe it will be fine. I haven’t done it, but it should be ok.
You can just use the recipe as is, the cake just won’t be as tall. Not entirely sure on the baking time. This cake was wonderful! I made it for my daughters birthday and I can’t wait for my next “excuse” to make it! This is the 2nd of your cakes I have made and so far I have not been disappointed. I’m so glad you’ve been happy the recipes! 🙂 Thanks Serrina! I haven’t tried it, but am pretty sure that wouldn’t work. Let me know how this turned out with the oil please. I use oil in cakes all the time and its completely fine! Does it make a heavy dense cake? Hi, I am in the UK and we don’t use the measuring cup system. I would love to make this vanilla cake for my kid’s chorus at Panto rehearsal/Christmas Party. It looks delish! Please could you let me have the imperial or metric measurements? That’s the prettiest cake I’ve ever seen! 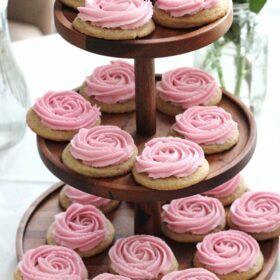 Question: I’m new to this, so did you just gradually add food coloring to the frosting to make it the color you wanted? If so, what kind (liquid, gel, etc)? I’m wanting to make a green frosted cake. Thanks in advance. Thank you Martha! I used gel icing color and gradually adding it using a toothpick, small amounts at a time. Is it fine to use just one cake pan? That would depend on the size of the pan. One 8 or 9 inch pan wouldn’t work. However a 9×13 pan should be fine, thought I haven’t tried it myself. Fantastic, moist cake recipe! People couldn’t believe it was homemade. I made this yesterday with your buttercream icing, and it was AMAZING!! Thanks for sharing! I did half the recipe and divided into two 6″ cake pans. Perfect amount, and it makes for a really tall cake! I usually use vanilla paste and vanilla extract, and it tasted wonderful! Please let me know if this cake freezes well. I want to make it two days in advance. Thanks! I haven’t tried freezing it, but it should be fine. You are the woman! I made this cake tonight and it is everything you promised. Thank you so much for sharing. I read some of the other comments and thought I would let everyone know that I used your recipe but made a six, eight and ten inch out of each recipe and then repeated and my cake is amazing. You are my hero! It’s a fairly tall cake. I think each layer of the cake is a little more than an inch. I haven’t made this as a 10in before, but it should be fine. You’d just end up with thinner layers so you’d want to bake them for less time. Maybe start at about 20 minutes and go up from there. Did you end up making this as a 10″? If so, how did it turn out? I’m so glad you enjoyed it! Thanks Heather! Hi, I love your blog! The tutorials and recipes are so good and easy to follow. Thanks for sharing this recipe. I made it yesterday. The taste and texture are excellent but I found it a bit oily. Would you recommend reducing the butter? If so, by how much? Thank you ! You could try reducing it, but I’m not sure that it’d turn out as well. This cake was amazing! My whole family loved it it’s definitely a recipe I will keep! These strawberry cakes are terrific and you could double it to make a cake. Hi, I tried the vanilla cupcakes and came out very well. 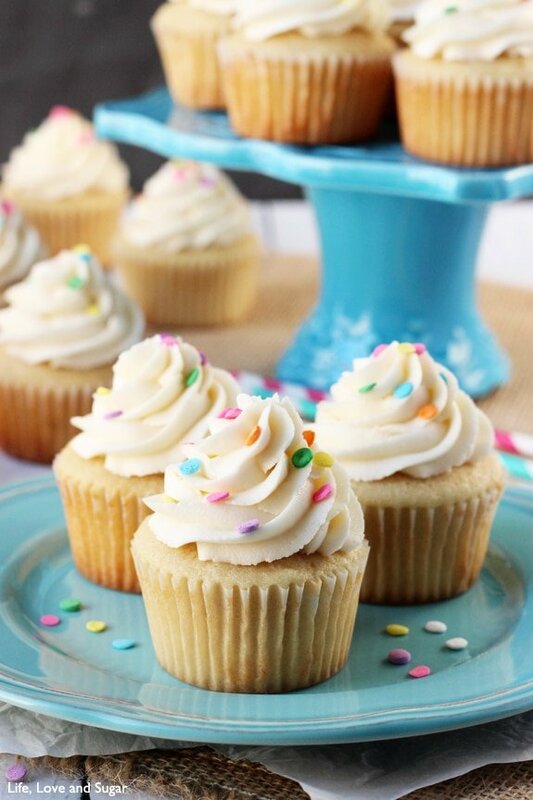 Everybody at home enjoyed and they had never ever tasted vanilla cupcakes like this before. I want to try the vanilla cake and have a doubt. I want to halve he recipe. instead of 3 cups flour i want to make with 1.5 cups flour. My doubt is regarding the baking soda it says 1/4 tsp for 3 cups flour and in the cup cake recipe also it is 1/4 tsp for 240 gms flour. Then for 1.5 cups flour how much baking soda should i use. For this cake, if you cut the recipe in half, you’d want to cut the baking soda and baking powder in half as well. So it’d be 1/8 tsp of baking soda and about 1 1/2 tsp baking powder. 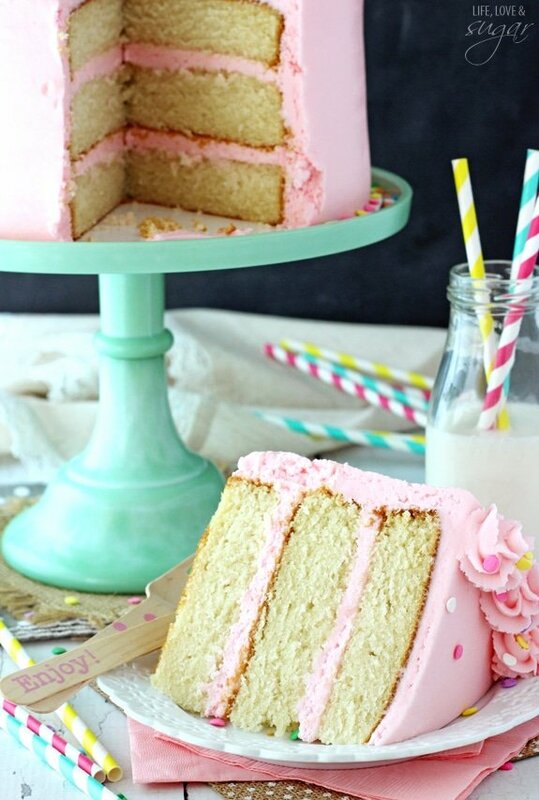 Hi, Lindsay — This vanilla cake looks gorgeous & I nominate you for Cake Queen. I too enjoy cake-making & would like to get your opinion about one aspect of it. I like to include some sour cream in a cake (even a mix cake), like my mom did, to make it moister. This has worked well with chocolate cakes so far. Have you ever made a vanilla cake that included sour cream? If so, what was your impression of the results? Thanks for sharing your great recipes! Hi Darnell! I’m definitely a big fan of using sour cream in cakes. I usually try to use it, but didn’t in this one. If you’d like to try a vanilla cake that does, this is a great one. Hi Lindsay! I am looking to make a chocolate chip cake. Have you ever tried adding mini chocolate chips to this recipe? Do you think it would work? I haven’t tried it. I’d think it’d be fine, but I’m not sure if they’d sink or not. You could also try this recipe. Just swap out the cherry juice in the cake with additional milk. My daughter made this cake for the second time today. When she made it the first time, it was extremely dense and gooey and very much like a pound cake. It tasted great but it was not what we expected. Today, she spent much more time creaming the butter and sugar and less time mixing the flour to keep the gluten in check. The cake was fluffier, but only slightly. We used 2 9-inch pans. Any ideas as to what we could be doing wrong? I’m sorry, I’m not sure. It’s so hard to say without seeing it myself. I’m sorry it isn’t turning out as expected. Hi Lindsay…am thking of making this cake of my daughters birthday but wanted to if it would work well with a Swiss meringue buttercream? It should be fine, yes. Buttermilk should be ok, but I haven’t tried to to say for sure. I wanted to thank you for sharing this recipe. Just made my second batch of cupcakes for my son’s birthday. They are indeed super moist. I’m so glad you are happy with them! Have you used fondant to cover this cake at all? I haven’t ever tried it. I’m sorry! Hi! Your vanilla cake looks amazing! What I was wondering was wether it’s firm enough to cover with fondant icing over either buttercream or ganache? I’m not sure. I don’t think I’ve ever used this cake for fondant before. It’s not a super firm cake, but might be fine. Is that compulsory to make it works? i live in a tropical island where the brandt crisco is not sold…. and I do not know if our french label fits… thanks a lot for your answer…. 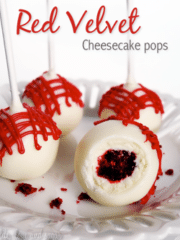 i’m longing to try this recipe…. You can replace the shortening with butter, if that’s what’s available. With all butter though, the frosting is a little less stable in warm weather. You might find it best to refrigerate the cake when frosted. Hi! Just baked this cake tonight in two 8″ round pans. They looked beautiful when i took them out of the oven, like total perfection. Put on rack for 15 minutes, and they deflated so much it looks really weird, almost half its thickness from when I took it out of the oven. Then went around with a knife and flipped the pan, and the sides are all crumbly and made quite a mess… and I tried pulling the parchment paper but there’s too much cake coming with it so I left it while it cools. I used Wilton’s bake even strips… could that have caused this mess? Any suggestion would be appreciated, ty! I haven’t used the bake even strips on this cake, but I wouldn’t think that’d be a problem. I’m not sure. It’s so hard to say what causes something like that without seeing it. I’m sorry. 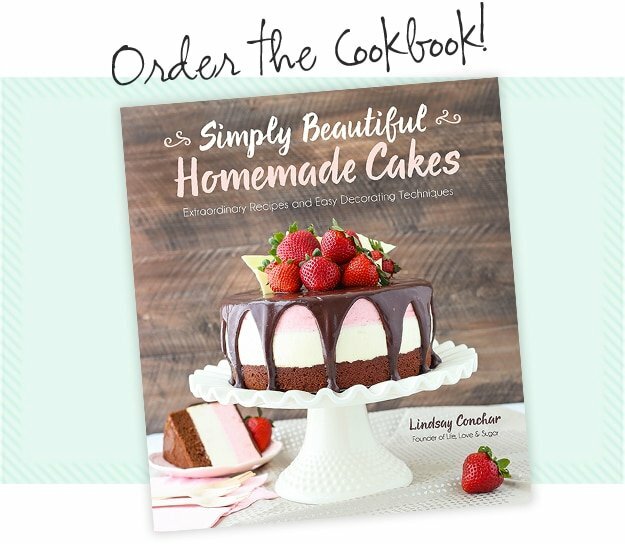 Hello Lindsay, i am so excited to try this recipe because all the vanilla cake i have been baking have been really heavy and dense, i really hope this comes out just the way i want it. will the texture come out different if i use unsalted butter. i see your recipe calls for salted butter. If you use unsalted butter, you should probably about about 1 tsp salt. Thanks! Can I double this recipe to make two 9x13x2 cakes? I have to make a cake tomorrow for a lot of people so I need to know as soon as possible. I’m sorry I wasn’t able to respond sooner. I haven’t made it in a 9×13 pan, but I think one full recipe makes a 9×13 cake just fine. Hello! Please help me! I need 9 inch layered cake so I have to double the recipe? This cake is amazing. I made it for my best friends 50th and i couldn’t believe how fast it went, people were disappointed there weren’t seconds. I would say though that the buttercream was really sweet, I may tweak it a bit next time. I LOVE your blog and can’t wait to try this cake. Can you please share with me how you got the beautiful color of the frosting? I can’t wait to try to frost my first cake like yours! I use Wilton icing colors that are easily found at craft stores like Michaels. I believe I just used pink with a little bit of burgundy. This cake looks great! I don’t have three 8 inch cake pans could I not put all the batter into one 8 by 3 inch cake pan? if so how long would i cook it for? I wouldn’t recommend that. It would be much too thick and most likely wouldn’t bake well. You’ll want to make at least 2 layers. Well, I do not recommend doing this cake in a 9×13…. After 35 minutes, the edges got dark brown and I thought the cake was done with the toothpick test… The middle flopped in when cooling and was still mushy. The edges tasted delicious though. So bummed! Had to toss the whole mess in the garbage. How would you modify the recipe for a two layer cake?? The only real difference would be baking time. I can’t remember if I’ve done this as two layers before so I’m not sure what the time would be. I’d start at about 35 minutes and go up from there. You’ll know it’s done when a toothpick inserted into the middle of the cake comes out with just a few crumbs. I am running into a little problem. I baked 3 6 inch cakes. I let them cool completely . When I removed them from the pan, they crumbled and fell apart. They taste good, but are in unusable. Any ideas of what went wrong? It’d be really hard to say from a distance. This is a pretty tender cake. Did they stick to the pans? Or were they really soft when you were moving them around and they broke? If they stuck to the pans, I really am a fan of putting parchment circles on the bottom. I’ve never had a cake stick when I do that. If it was an issue of moving the cakes around, I can only say that the cakes are pretty tender. I have some cake lifters I use that makes it easier. You could also try refrigerating or freezing the cakes for a bit to firm them up so that they are easier to work with. Hola, have your tried this cake under fondant? I can’t remember if I have or not. It’s been a while since I worked with fondant. It’s a pretty soft cake, but if you use ganache underneath the fondant, it should be fine. I would like to make this cake for my mother-in-law’s 85th. I have a 12 x 18 sheet cake pan. Should I double or triple the recipe? I haven’t made it in a 12×18 pan, so I’m really not sure. This cake is phenomenal… Making it two times in two weeks for work……rave reviews! My daughter and I just finished your recipe for your vanilla cake in a 13 x 9 pan it took 40min for it to turn out golden brown and the best vanilla cake we have ever made!! Look forward to trying some of your other recipes! Awesome! 🙂 So glad you both loved it! This cake is soooo delicious but I’ve had some troubles sadly when I take my cake out of the oven it has a gratey texture and it sinks am I doing something wrong?? Thank you ???? I made this cake the other day for my sister’s birthday and it was very good. I made the icing blue as well. It is very thick and the icing is very sweet and I actually had a lot left over. Maybe I’ll make some cupcakes for it. Thanks for the recipe! Hey! 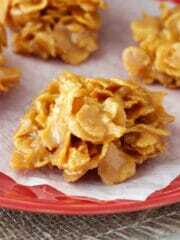 Just found your recipe on Pinterest and am going to give it a try for my sons 4th birthday party. He wants a red white and blue cake so I’m wondering if you think adding a bit of food coloring would change it/ruin it at all? I haven’t tried it, but I think it’d be ok. I did try your recipe and it was perfect! I’m thrilled with the results. Easy to put together and easy ingredients. I’m deleting all the other vanilla cake pins. It was moist and fluffy and had a lovely vanilla flavor. Lovely recipe. My neighbours were over for a birthday celebration and all wanted the recipe. I made two batches – one cake and 36 cupcakes. I was really excited to try this recipe, but it came out very greasy and then shrank in the pans and sank in the middles. It still tastes good and I covered it all up with frosting, but I’m sorry to say I was disappointed in the results. I searched online for a cake recipe and came across this one , BEST hands down it was so light and fluffy and taste great! Thank you so much for sharing this , I really enjoyed it. May I ask why you used all purpose flour over cake flour in this case? This. Cake. Is. AMAZING. Seriously. I made this cake for my son’s birthday party and I couldn’t help but revel in all the positive comments (even ones that said that it rivalled Magnolia’s vanilla cake). After several failed attempts at plain vanilla cake from other recipes (a thing which you would think you could get perfect as it is such a staple baked good), I found this one. I substituted buttermilk for milk (because I had more of it) and popped in two vanilla beans in addition to the ingredients listed. Pure vanilla dreaminess…. So light and moist. Also for the frosting I cut down the amount of icing sugar to 7 cups and it turned out amazing (I have several finicky family members who don’t like the icing too sweet but I’m sure the recipe as is is fine for the ordinary palate). Thank you! This is one for the vault! Wonderful! I’m so glad you loved it! Not sure if someone else has already asked this, but could you use two 9 inch round cake pans vs 3 8 inch? Thanks! You can, I’m just not sure of the baking time. Hi will this recipe too much for three 6′ round pan? Should I cut down the recipe? I would think it would be. I haven’t made it as a 6 inch, but I’d suggest cutting it down – maybe in half? I made this yesterday. I wrote a blog post about it today because it was so good! Thank you for sharing the recipe. Yum! Hello I want to make this cake but I only have unsalted butter, do you think it would be as good? Do I need to change something to the recipe? You’d just need to add salt to the recipe. I’d say about 1 tsp. I’m going to attempt this cake tomorrow. Definitely need to stock up on icing sugar, lol. 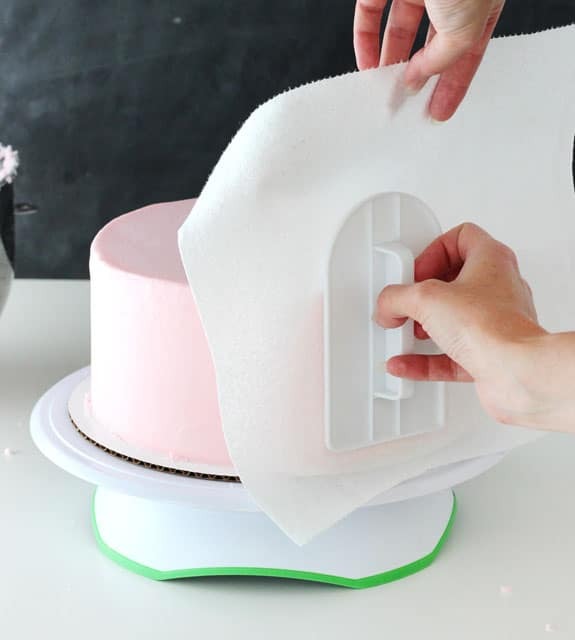 Love the post on how to smooth a cake perfectly as well! Am putting the tools on my birthday wish list! Keep ’em coming! I would think dying the batter would be fine for marbling, but I haven’t tried it. Also, I haven’t tried the 10 inch pan. There’s a fair amount of batter, so I’d certainly think you’d want to make two layers. Hi there, I LOVE this cake and it’s my go to, but I have a ?…every time I make it and a client cuts into it it so moist it just crumbles and not as firm as your to really hold shape once cut….what am I doing wrong? Thank you in advance! That’s really hard for me to say. I know some people add a sugar syrup to their cakes – if you do that perhaps it adds too much moisture? Could the frosting be a bit soft and not as stable to hold the cake layers up? If the cakes are baking fine, it seems like it could be something else? First THANK YOU for your response. No ma’am; the cake is so moist and delicious, I don’t need simple syrup. As far as my icing… it’s very stable and stiff… 🙁 it’s comes out wonderful. Should I leave it I the pan longer before removing it? Hi the cake looks amazing I am so happy that I found your blog. Would it work with liquid food colouring instead of gel food colouring? I’m so glad you found it too! 🙂 Liquid food coloring should be fine. I’d just be careful about adding too much additional liquid. planning to make this for my daughter’s first birthday tomorrow! as for the icing, do you think it would turn out well, omitting the shortening and using all butter (same proportions)? Yes, all butter should be fine. Enjoy it! I made this the other day and it’s absolutely perfect. Making it again, but wondering if it freezes well? I would think it should freeze fine. Glad you enjoyed it! Just make this cake. Batter tasted amazing! Lol couldn’t resist! After it cooled I sliced it into layers. The whole cake crumbled. It tastes so good and is really most but literally fell apart. No amount of frosting could glue it back together. Sad. On to another recipe. Do you know how many cups of batter your vanilla cake recipe makes? I am going to make a large sheet cake and need that information. I’m sorry, I don’t know. I didn’t measure it. Hi Sonya, I’m sorry I wasn’t able to get back to you sooner. I haven’t ever measured the amount of batter this recipe makes, so I can’t say. I’m not sure, I’ve never made this cake in that small of a pan. I’m so glad that i found your blog! Your cakes look yummy! I really want to try this one first, as this is the basic. I wonder, is it ok to substitute milk with heavy cream/whipping cream? Will the batter become too thick? The heavy cream would likely be too heavy for the cake, I’d stick with regular milk. I usually use 2%. I followed your recipe, using milk and the cake turns out great ! My husband brought it to his office and the cake gone in just few minutes. Everybody loves it! Hi,I was wondering if i could make cake pops out of this cake? I haven’t tried it to say for sure. I tried this recipe and it was perfect. I wish I can upload pics to show everyone. I used coconut butter/oil instead of the butter. I made a two tier cake with that recipe. I used fondant with this cake recipe. The cake was just right. What type of better are you supposed to use, plus can I replace shorting will unsalted butter. Please reply ASAP. I use salted butter in the frosting when combined with shortening. If you are using all butter, I’d suggest either half salted and half unsalted, or just all unsalted. I like some flavor from the salted butter, but all salted butter would be too much. Lindsay can you please help , i made this & followed the instructions step by step & i ended up with corn bread . It had the corn bread texture & tasted like it also . It can be really hard to say without being there to see, because there could be a number of factors. It kind of sounds like maybe some ingredients weren’t measured correctly? Hi there:) just found your recipe for the vanilla cake and it looks amazing! Before I dive into making it, if I substitute the all purpose flour to self raising and cut out the extra baking powders etc, would I ruin the cake texture?? I have just accidentally bought the wrong flour… Grrrrr. Hoping it would still work out?? What are your thoughts? Hmmm, the amount of leavener can vary in self rising flours I believe, so it’d be hard to say how that’d turn out. I wouldn’t recommend it. They’re pretty different. I’m making a cake for this weekend, and the customer would like it to b covered in fondant. Would this cake recipe be good for that? I want something that’s firm enough to hold the fondant, but still fluffy and moist to eat. I’m not sure if I’ve tried this cake with fondant or not. It is relatively soft, but if you are covering it with ganache or something under the fondant, it might be fine. 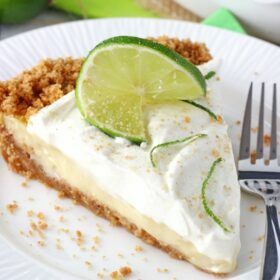 Hi could this be possible to make with 1 1/2 cups of sugar ? Or I also have brown sugar. I didn’t realise i wouldn’t have enough! I’m sorry, you really should have the full amount. Hello, please can I use all of my eggs in the recipe? Will it make it less moist or more dense? If I want to use it in my shop, I will be throwing away a lot of egg yolks. Absolutely amazing!!! This was the best vanilla cake I ever tried! Can I leave the cake mix in the fridge though? Or will it not work if I do that then put it in the oven? TYSM!! I’m glad you enjoyed it! I wouldn’t recommend allowing the prepared batter to sit before baking. I tried this but felt the icing was very overpowering in sweetness and I felt like it had a very strong vanilla flavor as well. Is there any way to make the icing not so sweet? The cake was absolutely delicious and moist! I’m glad you enjoyed the cake! For the frosting, you could add less powdered sugar, but it would also reduce the amount of frosting you end up with. Thanks for this recipe! Worked perfectly and made the loveliest base for a rainbow cake! Hi! What can I replace the butter with in the cake recipe to make it non dairy? I don’t do much non-dairy baking and I haven’t tried it with this cake, so it’d be hard to say. I know coconut oil is a common replacement, but I’m not really sure it’d work well. •I used Pam Baking Spray, I’m all out of parchment paper. •My batter may not have been well mixed. I say this because I saw some glossy parts with very small specs of butter, if that makes a good visual. But I’m just now using my kitchen aid mixer to bake a cake, and just getting acquainted with the speeds. So for medium, I used level 4. Level 6 seemed too fast. •I creamed the butter and sugar as suggested for 2 minutes. Added egg whites all at once, along with the vanilla. •I didn’t have the milk ready and separated into two 3/4 cups, but I just measured as I went. •Dry ingredients were measured using a digital scale, hopefully, it was accurate. So that’s all of the factors that could have an effect on the outcome. I’ll post later about how everything else goes. I just had to write ASAP, pregnancy brain is very real! Well, the cake came out tasting like flour…or play-doh as my sister put it. LOL. But I do believe it is due to me using a scale rather than actual measuring cups. And I used almond extract for the icing because I ran out of vanilla. So, I will retry this recipe in a few weeks, using all measuring cups and vanilla extract. Maybe even reduce the amount of flour. By my 31st birthday next year, I’ll have this mastered. I’m thinking maybe because I didn’t sift the flour, the scale measured more than needed? Idk. I’m just looking online for solutions or possible reasons to avoid this next time. The cake was MOIST, DENSE, and beautiful, so I know the recipe works. Everyone loved the texture, the aesthetic, and moistness. But I’m thinking maybe if I sift the flour, it would loosen it up and measure correctly on a scale. ???? I may even buy a better scale. This cake will not defeat me! Lol and now I know, if the batter smells like flour, the cake will taste like flour! And since I’m pregnant, I didn’t want to taste the batter. Anywho, when I retry the recipe, I’ll post my results and changed methods, just in case someone is going through the same as me. I would always recommend weighing dry ingredients, especially flour. There can be huge variation in the way people measure cups so that could definitely have been a factor. about the buttercream. Should I use mixer and cream the butter and shortening? Your recipe says mix, I am pretty confused. Yes, I use a mixer to beat them together for the buttercream. I’m going to make this cake tomorrow for my daughter’s 18th birthday. Can you tell me what kind of milk you used? I want it to be perfect! Thanks! I typically use 2% milk. Enjoy! Hi, I wanted to ask a question. I have to make a 11 inch round cake. I can make this recipe would have to fold the ingredients? Can you help me please. I’m sure I understand your question. If you are wondering about doubling the recipe for a larger cake, I’d say you’d probably need to. I haven’t made an 11 inch so I’m not sure how to advise. Would you be making a three layer cake still? Or one layer? Yes, cake flour will not work with this recipe. If you’d like a version of this cake that uses cake flour, try this one. Lindsay, I have an important question for you. the batter for the cake tasted amazing, I baked this cake last night and haven’t tried the actual cake yet but I’m sure it’s great! One thing is: no matter how many recipes for cakes I try, I ALWAYS get hard crusty edges. I bake the cakes very well and I do not over bake them. The middle turns out excellent but the edges are always crusty. How do I fix this? Thanks! It’s tough to know for sure what the problem is, but a few options – overbaking (which it sounds like you don’t do), the baking spray you use (I use Bakers Joy), or the pan you use (light colored pans tend to be better for not getting those crusty edges). I hope that helps! I am SO excited to try this! I am an avid baker – and primarily do cakes bake my cakes in 3″ pans (something like this i would do in 2 of them, then use stainless flower nail like baking cores that prevent the center from being under cooked!). I am going to try it today, and will let you know how it comes out! Could you swap out the vanilla buttercream for your strawberry buttercream recipe? The vanilla appears to be thicker, more powdered sugar, and I wanted to make sure that if I swapped them it would be ok. This cake is gorgeous. I’m a self-proclaimed cake connoisseur, and this is the best white cake I’ve EVER had (and to boot, *I* made it)! Hi Lindsay, I’ve just made this cake for my sisters birthday! It tastes delicious but mine has fallen apart 🙁 it’s really most on the inside and my skewer came out clear but perhaps it was undercooked and that’s why it’s shape hasn’t held? 🙁 and also I’m from the uk so I used a vegetable shortening called Trex and its made my icing taste a bit funny! Well practice makes perfect so I’m hoping to crack this recipe! The cake itself is soooo yummy though! I look forward to trying other recipes of yours. Your recipe looks amazing. What altitude are you at? I will try this recipe but may need to tweak it for a higher altitude. Renata, did you try this at a higher altitude? I am in Denver and am considering this recipe? What adjustments did you make and how did it turn out? I see there are very mixed comments, so I’m a little worried ???? Can you use unsalted butter for the fluffy vanilla cake receipe? Yes, you’ll just want to add salt – probably about 1/2 tsp. Hi will it work under fondant? What is the reason for omitting the egg yolks pls? Dont egg yolks add a little oomph to the taste? I haven’t tried it under fondant, but I would think so. Eggs vs egg whites is a choice for several reasons when making cake recipes. However if you wanted to replace the egg whites with eggs, you’d have to try it. Sometimes it’ll work as a substation, sometimes it won’t. 350 degrees … Is that Celsius or however you spell it. I have never passed 180. That’s Fahrenheit. It would be 176°C. I’m so glad I found this recipe! I’ve been searching for the perfect vanilla cake that isn’t dry and horrible. This is the perfect light and fluffy texture I was after! Thank you! Nice one and thanks for sharing you quite generous. Question. Why is your sugar measurement more than the flour,and butter and the eggs just 4? Thank you for your moist and fluffy vanilla cake recipe. I just made it and am amazed. It smells like our favorite bakery in my kitchen right now. I really never thought it was possible to make a vanilla cake well from scratch. I bake a ton, and vanilla cake was never something I made until now – I can tell this will be a favorite. Thanks again! Tried this 3 times, each time a disaster. Was like play dough. So I cooked it 15 more minutes and was done,better, but then the outside was a crispy critter! Boo!!! ???????? In the past, every time I would attempt to make a vanilla cake, it would end up tasting like cornbread, so I’ve been sticking to chocolate cake the last several years. Unfortunately my 7 year old hasn’t liked chocolate over the past few years. I’m looking to make a cake for my little one’s 3rd birthday that the whole family will eat. Can anybody tell me what I did wrong with my vanilla cakes in the past? This was my first “from scratch” cake. It was my first time, so maybe I did something wrong? Hi I’ve tried your vanilla cake recipe but it flopped twice. . What am I doing wrong.? I used the grams, so do you think I should try the cup measurements? It’s so fluffy and nice but collapsed in the middle. I baked it for 30min at first and I tried it for 45min and the same thing happened. 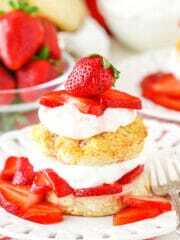 I would like to perfect this one cause it seems to be delicious and moist and not dense like other vanilla cakes? ? I’m really not sure. I’ve never had it collapse in the center before. Would this recipe work if I used 3 9in pans instead of 3 8in pans? Or would I need to make more batter? Thanks! Yes, it’d work, it just wouldn’t be as tall. I made your vanilla cupcake and they were amazing. 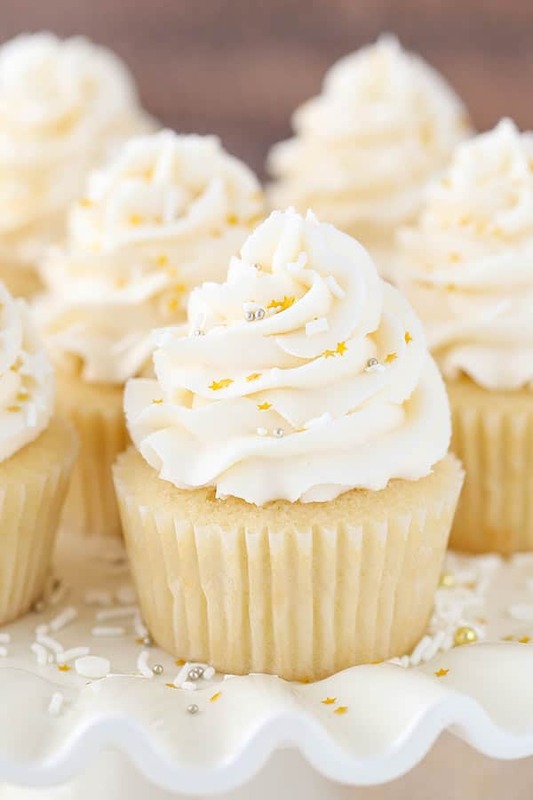 Thank you for ending my search for the perfect vanilla cupcake recipe. So am going to try your vanilla cake for my son’s up coming birthday. Just wondering if this cake freezes well? Made this cake yesterday. I used two 9 inch pans. The time was a little bit longer, about 40 minutes. I refrigerated overnight before frosting. Cakes were firm and easy to handle right out of the fridge. The cake was Moist, Fluffly and delicious. This has been one of the best vanilla cakes I ever made. Quick question: is there a chocolate version of this cake? I haven’t baked it all in one pan before so I’m not sure how well it’d bake. Sadly, I feel the same exact way about the overall taste of it. I made the cake today and it was a one note type flavor, it lacked flavor and my kids didn’t care for it either. I cany wait to make and eat this cake! I’m wondering if I could use vanilla bean paste instead of vanilla extract? I ran out of extract but have the pasts on hand. This is exactly what I’m looking for! 3 layer cake with 8 inch pans. If I use cake flour, how would you modify this recipe? Thank you so much! This is the version of the cake that uses cake flour. Yes, it should be fine as a square. I want to make this in a 9 x 13 pan-should I change anything? I haven’t tried it, but I know you’ll need to adjust the baking time. Hi Elyse, the metric grams are correct. Cups measurements here are more of a volume measurement, not weight. So they may have a similar volume of 2 cups, but then weight differently. I hope that helps! Sounds great! I only have unsalted butter on hand, will that work? Yes, you’ll just want to add your own salt to the recipe. Maybe 3/4 tsp? I want to use this recipe, but I only have 1 cake pan….. if I make the batter and cook the cakes one at a time, will it keep ok while it sits between baking?? Should I keep it room temp or in the fridge? Hard to say for sure. It might bake a touch differently after sitting, but should be ok. I’d let it sit at room temp. Just wanted to let you know I made this cake and it was delicious. I had about a cup of buttermilk, so I used it and added additional milk instead of regular milk, and it still turned out great. It may have been a little more dense, but I liked it. I also used a favorite buttercream frosting that has a little Kosher salt and lemon juice making it not quite as sweet as some others – the whole thing was a hit. Thank you for your great recipe and research. I recently used this recipe because I too have been searching for a really good vanilla cake recipe and I loved it! Thank you so much for oUtting this up! The cake is moist and sweet but not too dense and not too light! I also made the icing with the recipe that you provided and it was so good! I could smooth it really easily too which was great! Thank you so much!! Reading and seeing cake photos, it seems the cake is quite sweet and appears dense. I am searching for a very light cake, fluffy and moist and feel that adding more water to recipe would make it taste more like what I’m after; also thinking about adding 1 (one) egg yolk to heighten the savory ‘yellow’ vanilla flavor. What do you say about adding more water, perhaps reducing the milk as well as using 1 egg yolk with the 3 whites? I wouldn’t be able to say if that’d work without trying it. Have you ever added a little powdered milk to the recipe to lighten/ add a few more air bubbles to the recipe? I learned this from a professional baker, but don’t know the proportions. – Can I use egg whites that come in a carton? – Do I have to Sift the flour, baking powder and baking soda together? Just wanted to make sure if any of this will make a difference in the texture of the cake. Hello Lindsay! Thanks so much for a delicious cake. However, I would list your title as ‘moist’ and ‘buttery’– rather than “light and fluffy”. I haven’t baked a cake in a while or I would have lessened the butter to make it less heavy. However, if someone is looking for a butter cake, it was tasty! Thanks! Can this be made In a 9inch round pan ? I only have this one pan and I was wondering if I can divide it into two or three and bake separately? It should be fine, you’ll just need to adjust the baking time to a little less. This Thursday is my b-day! I just made this cake and there are about ten minutes left on the timer. After reading every review which was a feet I knew this would be the perfect cake! I’m sorry I couldn’t give a real review. I am wanting to make a small smash cake with this recipe. Could you tell me how to modify for just 1 round 8″? There are probably several ways to go about it. Easiest would be to cut the recipe in half and bake it one layer. I haven’t done it though so I can’t advise on bake time, etc. 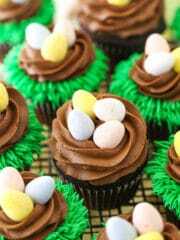 I’ve been looking for a great recipe to use in my cakes for decorating. I’m a Certified Wilton Method Instructor, teaching students how to decorate cakes. This is the recipe I’m trying for my class on Thursday. 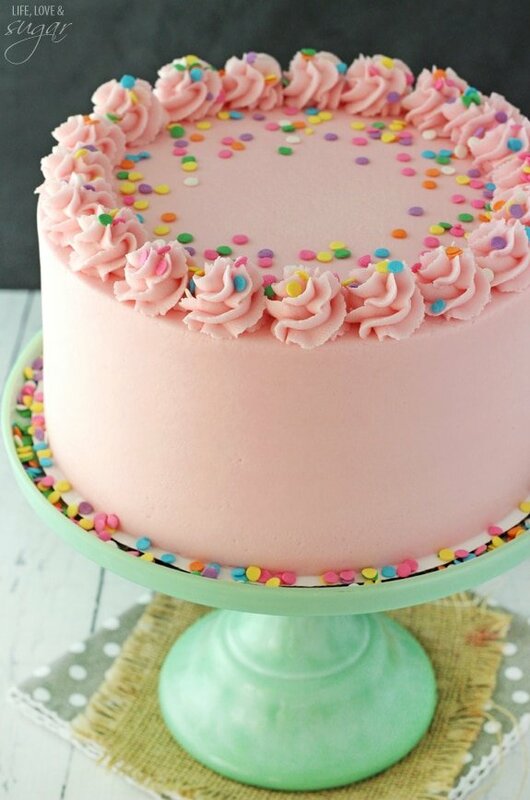 Hi – is the frosting enough to frost and till 2 layered 10 inch cakes? Thanks! Do you mean a 10 inch cake with 2 layers? Or two full 10 inch layered cakes? For me, I used this frosting on an 8 inch cake. You could probably stretch it to a 9 inch, but a 10 inch might be a stretch depending on how much frosting you usually use. Hi, the recipe is for 3 layers, if i want 1 layer of 8 inch, i need to divide by 3? Depends on how thick of a cake you want. If you want it taller, you could try cutting it in half. It’s actually teaspoons (tsp). Tablespoons would be tbsp. And yes, two full teaspoons, plus 3/4 teaspoon. Hi. Can we use unsalted butter. Dint take notice of the salted bit. Please help. Tried your vanilla cupcakes. They are brilliant. Thanks. Yes, you can use unsalted butter, you’ll just need to add some salt to the recipe – probably about 1/2 tsp. im in Australia and was just wondering weather the sugar you use in most of your recipes is regular sugar or castor sugar when i bake i usually use castor sugar not sure if thats what im supposed to be using as castor sugar is alot finer then regular sugar?? Unless otherwise stated, I use granulated sugar in my recipes. I’m so glad you enjoyed it! It looks great! I made this cake today, as written, no substitutions, weighed everything and even used Challenge Butter… so basically I’m saying followed the above recipe to a T. I bake a LOT and was hoping this was going to be everything I wanted in a vanilla cake but it was not. I read almost all the past comments and saw a lot of people comment on LIKING the idea of the recipe but not a lot of people actually MAKING it and giving feedback (only a small percentage). Now, while the cake was moist, it was not “fluffy”, it was more dense and tasted very similar to a cake made with a lot of Crisco, pound cake like texture. The cake itself (without any buttercream) was a bit sweet. I opted for a vanilla Swiss meringue buttercream instead. I read in previous comments someone said that the cake tasted like “play-doh” and as crazy as that may sound, that’s an accurate comparison. As in previous comments, the edges get a bit crispy too, the cake also shrinks a lot and my parchment actually stuck a bit to the bottom of the cake. I will not make this cake again. My husband and children were not fans either, they just said it tasted “weird”. I am confident in my baking that I prepared everything as it should be so no second chance here. Thank you for the recipe but I’m off in search of another. If I wanted to use cake flour instead of all purpose flour will the recipe change? If so, how? If not, please let me know! I made this today and infused the milk with tea bags and it was DELICIOUS! Just wanted to let people know this is a perfect recipe for doing this. Thank you so much for such a wonderful cake. Hi can you add jam to this cake in between the layers ? Will it taste as good ? Hi Kara! I plan on trying this recipe next week – it looks awesome. Would I need to adjust anything for different pan sizes for future reference? Thank you so much! 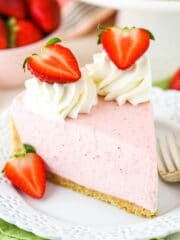 I am using this recipe to make a double (9×13) white cake with raspberry filling and whipped-cream, cream cheese frosting for my daughter’s swim team banquet dessert competition held this Friday. It is literally in the oven as we speak and I could not get over how smooth, light and creamy the batter is! This is just a test run….the real cake will be made Thursday with Olympic Pool Theme decor and all! I tried another recipe I found….The best white cake ever….it was terrible!! Both my husband and daughter felt it was extremely “bready” with no flavor! Fingers crossed on this one! It has been in for 30 minutes and is far from done. The edges are golden brown so I lined them with tin foil so that it will not brown anymore as the middle cooks. I will update after!!! Thank you for sharing!!! How did this turn out for you? Thanks! Hafa Adai Lindsay from the island of Guam, I just prepared this cake today for my birthday. This was my first cake from scratch and it turned out delicious! My children found it yummy. It was moist with a slightly crisp edge. Definitely a dense cake but not at all hard. The vanilla taste was full. My oldest son said he considered it a pound cake and absolutely loved it although he believes it would surely add a few pounds to his waist just by inhalation alone. I didn’t weigh any of the ingredients but the end result looked exactly like your cake. It was very easy to handle and slip out of the pans. Also, the icing easily spread to perfection. There were no crumbles that I normally dealt with when making a boxed mix cake. My 75 year old mother had seconds. This cake recipe is a keeper but will only be used for special occasions. Everyone said, this would make wonderful recipe for a wedding cake. It is a bit new for me to add the ingredients in the phases presented but not at all difficult. I cooked the cake for 31 mins, cooled them in the refrigerator for 40 minutes while I prepared the icing. I can’t think of any tweaking except maybe the title. Hee Hee. 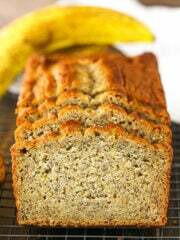 I would call it “Rich and Moist Goodness!” Thank you for this wonderful recipe. Hi, please can you tell me what number icing tip you used for the swirls on top of the cake? I make this all the time and it is perfect. Everyone loves it. Glad you enjoy it! It’s Ateco tip 844. How long in advance can you make the cake? The cake should be good for 2-3 days. Hi, can I replace the butter for oil? Or use half butter half oil? I wouldn’t suggest it with this cake. If you’d like an oil-based cake, I’d suggest trying the cake layers in this one this one. It shouldn’t shrink like that when cooling. It will definitely end up denser if it does. You could try out the vanilla cake layers in this recipe. There also this one. Hi, Lindsay – your chocolate cake (coconut) is my go to cake recipe for all occasions – very loved by all! However, I am planning a 50th anniversary party for my parents and decided to do a replica of their wedding cake which was simple….so I want to do a yellow…white cake – which I never do – if I’m doing a cake – it’s always chocolate! ! Do you have any recommendations of which recipe you would use? I’m so glad you enjoy the chocolate cake. 🙂 There sam to be an array of preferences when it comes to vanilla cake. This one is certainly very good. This one is the vanilla version of the chocolate cake you mentioned, so you could try that as well. And then there’s this one, which is probably my favorite. Have you made this in a 13×9 pan? Do you think this recipe will have enough batter for a 13×9 plus a 8×8 cake? Thank you! I haven’t, but I think others have and said it was successful. I imagine it will just make one 9×13 cake. I haven’t tried it with this cake. I might suggest using the cake layers from this cake instead. They should color fine. Thanks for the speedy reply and for another recipe alternative. I only stuck with this one because I need a denser cake to hold up cookie skewers this recipe dyed really well I used 12 drops per bowl of batter (approximately 2 cups a bowl) and it was perfect. Hi, I’ve made this cake twice now. It tastes amazingly good. I have a real issue with it sticking in the pan and falling apart though. I’m not a baking novice by any stretch so am wondering what I could be doing wrong. The first time I actually baked it in 3 separate tins and allowed them all to completely cool before removing and they stuck to the tin. This time (literally just now) I’ve baked the first cake, it had been cooling for over 10 minutes, still felt warmish and it just fell apart! SO I have the rest to bake now, will try and let it cool longer or something as it’s for my birthday cake for tomorrow and I don’t want to have to go buy something. This mess here is only good for drizzling caramel sauce over and eating by the spoonful. It would be really difficult for me to know what’s causing it. I don’t seem to have the same problem. I’m not sure how you remove the cakes, but maybe a different method would help with it not falling apart? When I’m trying to be especially careful, I place a parchment lined cooling rack over the top of the cake pan and just turn it over so the cake doesn’t have far to go before landing on the cooling rack and it shouldn’t fall apart. I hope you’re able to get it to work! Also might be what you’re using to geese your pan. I use margarine and run a butter knife around the edge. Then I’ll lay my parchment on top my cooling rack on top and it never sticks I promise. I made your cake early this week for a charity bake morning at work and had so many compliments, your recipe is delicious! I changed it up slightly and made the buttercream frosting strawberry flavour and I spread a really tangy lemon curd on to the layers aswell so it wasn’t so sweet. Lovely combination. So glad I found your blog. One question is about the texture of the outside of the cake. I baked for 30 mins. The tops were a little brown, but your recipe said not to worry about that. But the outside of the cake was harder than I expected but the inside was still soft if not a tad darker than your pictures. Do you think I need less cooking time with my oven so that they aren’t as crispy/hard on the outside? For the fire edge, it’s hard to say. Could be a number of things. This cake does tend to get a tiny “crust” around the top edges for me that I usually just pull off. Another possibility is some difference between ovens. Also, darker pans can produce a darker cake. I use light colored pans. We’re using this recipe to make the middle child’s birthday cake this weekend. Thanks for always being our “go to” for deliciousness, Lindsay. Could you add oreos to this cake to make it cookies and cream flavored? I’d like to give this one a try. Will it work to cut the cake recipe ingredients down to 2/3 the amount to make just 2 layers? Thank you! Hi Lindsay, how high do each of your vanilla cakes rise? Mine don’t seem to have risen much higher than when they went into the oven. Thanks! It’s been a while since I made this particular recipe, but I’d say around 1 to 1 1/2 inches. Very helpful! I’m so glad you enjoyed it! Thanks Meg! Hi… May I know the substitute for sour cream… ? ?I don’t find it in my place… thank you..
Cake looks amazing! If I wanted to use unsalted butter. Do I need to add salt and how much? Yes, I’d try 3/4 tsp – 1 tsp. Hey! Since your recipe just says 8″ and the picture seems that the layers aren’t that think I was thinking I might have a different size pan. Mine that I want to try is 8×3 round I want my cake to be tall so I may do 3 layers of this size if it will work? Would that mean this recipe would fill one pan 8×3? I’m not sure what you mean, but the cake in the photo is made with three 8 inch cake pans as the recipe notes. I wouldn’t suggest baking all the batter in one pan. It’ll be a very thick cake that will take much longer to bake and end up overbaked on the outside. You’ll want to use at least two pans. Hi Lindsay! My daughter wanted to bake her dad a vanilla birthday ! After searching on the internet we found your recipe. It turned out moist , fluffy ad delicious. We made a few tweeks. .. grated some orange runs and mixed it with vanilla essence. Melted the butter to semi liquid. Thank you for sharing. She is more inspired to bake. Some more. Sounds wonderful! Glad you enjoyed it! hello. i made as per instructions but my batter split any idea why? kitchen is v warm. will it be useable? Hello! I am baking a cake for a baby shower and I did a test of this recipe tonight and it didn’t turn out! I did half the batch to limit the amount of cake I have sitting at home. Could this be the reason why? I also split the batter between an 8″ pan and a 6″ pan. The cakes didn’t bake all the way through and the edges rised a lot quicker and are hard. I had the cakes in longer than the 30-35 minute bake time and they are still underbaked. Any ideas? Was it because I halved the recipe? Thanks in advance! I wouldn’t think it be because of halving the recipe. It sounds like it didn’t bake evenly. You could try using bake even strips. They prevent the outside of the pan from baking too much faster than the inside of the pan. Thank you for your respond! I did try this again and made a cake and a batch of cupcakes and they turned out perfectly. The cake and frosting were delicious! It was definitely a hit. Thank you for you help and suggestion. I believe my problem was the mixing, I was using the wrong speed on my kitchaid mixer, rookie mistake! This cake is wonderful love it, but I would like to bake it in a 14″ round pan and dense it up a little what would I do to do this? Hi Lindsay, thank you for the recipe. I made 2 times already. One for my birthday I used 2x 8 inch round pans. I always use parchment paper on the bottom of the pans so it will slide out easily after bake. Then I made 37 cupcakes for my son’s Lacrosse party. I made vanilla creamcheese buttercream. Its great combination. For my 8 inch cake, i made 2 layers. Your cake is so moist and tasty. Everyone loves it. Thank you so much . Too bad I can’t post my cake pictures here. Will this cake be sturdy enough to put fondant over it? And if so, how far in advance can I bake the cake without it becoming dry? I’m not sure if I’ve tried it. It’s been a while since working with fondant. I like the sound of this cake but I need to make a 12inch round. Do you think the recipe will be enough or should I double it etc. I’ve already tried a different recipe that I doubled and it didn’t turn out well. Any advice would be great. Thanks!! I am looking for a recipe for my son’s 4th birthday. He is allergic to eggs and has not really had cake before. We’ve tried a few recipes here and there with different egg replacer options, but nothing has been super delicious. I recently purchased a product called Ener-G. It’s made from potato starch and tapioca flour. Do you have any thoughts or suggestions to make this an eggless recipe for my little guy? Thanks!!! Hello! I tried the vanilla fluffy cake recipe and it worked fine! However, the 350 for 30-33 minutes did not work for me. I ended up baking the cakes for almost an hour, at 30 minutes the cakes were still watery. It might of been the tins I used but I just wanted to give a heads up for future reference! I tried your recipe tonight. What should the batter consistency be like? I am used to a ‘wet’ batter, but this one was almost whipped, I suppose from all the butter. I used an 8×3 Wilton pan, but ended up using some of the batter for cupcakes as it was too much for the pan. As the cake is cooling now, the middle has sunk quite a bit, and the edges are hard. I’m an experienced baker, so I’m wondering if this is normal for the recipe, or if it’s possible that I did something wrong. I know you can’t tell without seeing it in person, just hoping my description is enough to give you something to go on. Hi Mandy, it sounds like you used one cake pan for all the cake batter. Is that correct? If so, that’d be the problem. The recipe is written with 3 pans, but at the least would need to use two. One pan is going to be very thick and cook unevenly, which would be why you got the result you did. Thank you for replying! It was a single pan, but it is 3″ high, and meant to replace having to use two or three single-layer pans. The cake is then torted instead of stacked. I also used some batter for cupcakes so the pan wasn’t overflowing. Curious about my consistency question, though. Was my “whipped” result correct? That’s how it finished before putting it to bake. Yes, I understand torting cakes, but this still won’t bake well all in one pan. Normally in my experience, you’d still bake at least two cake layers and then torte those into 4 layers. And yes, it’s very light batter. You could probably describe it as “whipped”. WOW! I have searched for years for a vanilla cake that was moist enough for my taste, and my search has ended! This is hands-down the best vanilla cake I have ever had the pleasure of baking. 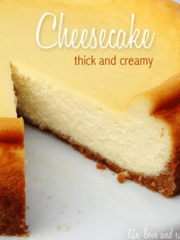 The edges are crunchy and flavourful while the middle is moist and fluffy. The texture AND flavour are both perfect. I can’t thank you enough. My daughters’ birthday party will feature this fantastic cake on Sunday. Thanks Mariam! I haven’t tried it with cake flour, so I’m not entirely sure. You could try out this version. Hi, i’m wondering if i use the exact measure of this recipe and i only want to make a two layer cake, what size of bigger pans should i use? thankyou. I made this cake for my daughters 3rd birthday. I used 3, 9″ cake pans. That was the only thing I did not follow on this recipe. I mixed everything on medium, set up a timer for the exact minutes, so as to not over mix the cake. I also made it the day before, and I followed your advice on how to smooth the cake too. This cake was pure perfection. My entire crew loved it, including the birthday girl. My mother, who doesn’t usually like buttercream, vanilla cakes- RAVED about it. Hi ya. This cake is delish. I live in France but can’t get my hands on what I think is plain flour so I’m using ‘cake flour’. So assumed to leave out the baking powder and soda. The cakes turning out a little crumbly. Can you advise what might be a solution to this given I only have cake flour. Should I still add baking powder and soda? It tastes amazing though! Here’s a version of this recipe with cake flour. I hope that helps! I made this cake last night for my boyfriends birthday. The icing is absolutely awful. I had never seen a recipe use shortening before but thought what the heck. I will never make that mistake again. I have never had so much difficulty making icing like I did last night. Fingers crossed the taste is better than the consistency. I’m not sure why it was so difficult, but shortening shouldn’t make the frosting more difficult to make. That said, you can easily swap it out for butter. If interested, here is a post on how I make my frosting and why and one on getting the right consistency. If i am to use cake flour instead would that be fine or there will be huge difference? Hi, I’m in search of the perfect vanilla cake and so am planning to try this for my daughter’s 2nd birthday. This may be a silly question, but do you whisk the egg whites before adding to the mix, or just add as you would if they were whole eggs? Thanks in advance! I don’t whisk them before adding. This version uses cake flour. Hi! I love your vanilla cupcakes so I’m hoping to try this recipe. One question – have you tried this in a 6 inch pan? My go to vanilla cake is finicky and only works in my 8-9 inch rounds. I’m hoping your recipe can be my go to for smash cakes! I haven’t tried it in a 6 inch pan. The vanilla base of this cake is one that I use quite often though and it doesn’t seem to be finicky. You could try that one as well. Do you use whole milk? What do you prefer or recomend? I made the moist vanilla cupcakes last year and got the best compliment where I was asked where I got the delicious cupcakes! I would like to make a sheet cake and was wondering if the measurements of baking times change with the moist and fluffy cake for a 9×13 sheet cake. Thanks! This might be a little dense as a cake. I’d suggest trying this one or this one. I made this(moist and fluffy vanilla cake) recently and I have to say your recipe is by far one the most delicious and succesful ones I’ve ever made. Your description on how it would turn out was accurate to the dot, the cake was really good and finished so fast by my brothers. It reminded us of a cake we used to buy from our favorite bakery back when we were kids. Definitely gonna make this again. 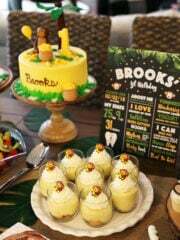 Hello Lindsay, your cakes look beautiful and i am planning to try out this recipe for my son’s birthday. I was wondering if you might have any advice on how far in advance can i make different parts of the recipe so that i don’t end up doing it all last minute? I am also planning to ice a pooh bear design on baking paper/transparency and transfering the image onto the top of the cake. Do you have any high altitude adjustments ? above 5000 or will this work ? I’m glad you’ve been enjoying the site! When you say one layer, do you mean one 8 inch layer? Or are you planning on making a larger cake? If just an 8 inch, I’d suggest cutting the recipe in half. You’ll have more batter in the pan, so you’ll also need to increase baking time a bit. I’m really excited to try this recipe! I have a couple of questions though. 1. Can I use this amount of mix to fill two 5”x4” molds? And will the cake cook evenly in that type of mood? I’m not sure about that size pan. I don’t believe this cake would turn out if you just add cocoa. For a chocolate cake, I’d suggest this one. Made this cake for a baby shower at work yesterday and people who weren’t even there are still talking about it! I made my own raspberry filling and used your white Chocolate ganache recipe from your Sparkling Cranberry Cake (huge hit at Christmas!). Absolutely gorgeous and delicious. Thank you for this. 2 of the best cakes I’ve ever made & will be my go-to base forever. I just made this cake and it turned out amazing! But I am scared that if I put it in the fridge, it will harden and lose the fluffiness. Is it going to be like that or is it safe to refrigerate? Because it’s summer where I am and the cream might spoil during the night.. so I don’t really know what to do. Glad you’re enjoying the site! I do think that refrigerating changes the texture of the cake a bit, but if you let it come back to room temperature before serving, it should be fine. Hi Lindsay, I’m really excited about making this moist vanilla cake. I just want to know what kind of shortening you used and which is the best brand to buy. I use Crisco. Feel free to give that a try, or to use additional butter in place of the shortening, if you prefer. You’re like the worst person at making this cake easy!! Why did you put the ingredients & directions separate . I see what your intentions were. But as far as the whole thing goes I mights well be pulling my hair out! My daughter thinks I’m getting mad at her when really I’m getting mad that I have to slide up to see what I need then slide all the way back down to see how to do it. Why didn’t you list the ingredients then put the measurements with the directions? Or leave it as is and add the measurements to the directions upon telling what to put in what? This is literally the worst/complicating listing for a cake I’ve done!! I wanted to look for a new one but I’m already half way through .???? There’s no need in stopping now.???? I well be done with this cake next year!???? Hi beautiful cake! I wanted to make this icing blue for a cake does that change the icing recipe if I add food coloring? No it doesn’t change the recipe. I would suggest using blue gel icing color though, rather than regular food coloring. Yo’d have to add a good bit to get a nice shade of blue. Hello! 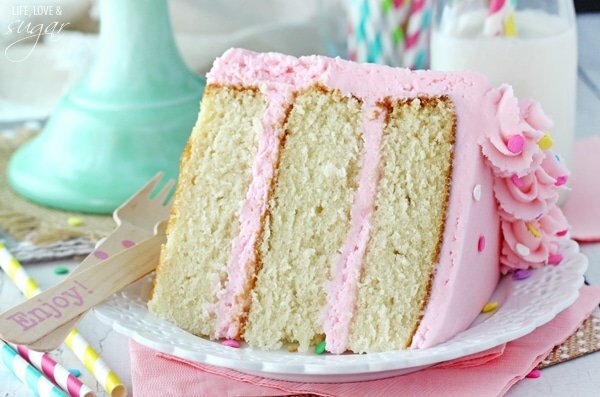 I am baking a baby shower cake for 30 or so people, and I would love to use this recipe. How many slices could I get out of this recipe if we did thin slices? What this recipe work for a 9×13 cake pan? If so, do you have any idea what the time adjustments would be. I just want to say to save others from this, i made this cake choosing this recipe quickly as i was on a time crunch, i took it to my little brothers birthday party 15 people were there and every single one including myself thought this was the worst cake they had ever eaten, wow it was so terrible and since im known for baking awesome cakes this was so embarrassing for me. i made the recipe exactly as written, dont make this cake unless you can make a test cake before the event learn from my mistakes ended up throwing it away immediately. I wonder what went wrong i have made this cake 6 times and about 12 people i gave to try are obsessed. I did sift the flour and make sure to use butter not margarine. Do you sift the dry ingredients together? I don’t typically sift, I just combine everything and whisk it all together. But I also bake all the time so my flour doesn’t sit for long. I don’t use my flour often at all so should I sift it then? Would it change anything about the cake? Sifting wouldn’t hurt. The main thing you’re trying to achieve is the right measurement of flour. Not everyone measures cups accurately. If it’s packed too much, you’ll end up with more flour than you should. That’s why I also include the weight measurements (which is what I actually use when baking). Weight is more accurate than volume. That said, you can either sift it or give it a really good stir and then scoop out the flour and you should be fine. Ok so ive made this cake numerous times and its deiicious except that when i make it its so stuck to the pan that it breaks on me. So its the most moist cake i have ever made but I’m thinking could it be the sugar that is causing it to stick. I have to make a cake in two weeks and this is by far my fave recipe I don’t want to have to look for another last minute. Also i did not use parchment paper as i never really do i butter or grease my pans. so edges are to hard and center is to moist i need this a bit sturdy to pull out of the pan. Please help!!! I’m sorry it’s been sticking. I always use parchment in the bottom of the pan and baking spray to ensure cakes don’t stick, so that’d be my best advice. At some point, you might also want to try this new vanilla cake. Hi Lindsay, the cake was delicious, it turned out really well, but how do you level a cake, because when my cake came out i only level the top because the bottom is flat but when i levelled it with a knife some parts of the cake crumbs came out which made a lot of holes in the cake. Is there anyway i can make it levelled well? I just use a long serrated knife for leveling. It does reveal the air pockets in the cake when you level it, but that shouldn’t cause an issue. If cutting it is tearing up the cake, you might need a sharper knife. The taste is absolutely amazing but i faced a few problems. First of all, I followed the quantities and instructions to the letter but at 33 minutes of cooking all three cakes were still in batter state, even though I didn’t put the one under the other. I actually had to double the cooking time. When i got them out they were cooked but still nice and moist. But the cakes themselves are extremely fragile.. they fall apart while i put the frosting on. Such a shame because the cakes taste divine. It was supposed to be by daughter’s birthday cake for tomorrow but I don’t know if i can salvage it.. I can’t speak for the baking time – it’s accurate in my oven. But if the cakes were difficult to frost, consider thinning out the frosting a bit. You should definitely be able to frost the cakes without an issue. Thank you. I’m thinking next time I’ll try freezing the cakes for an hour before frosting them.. I want to make a marbled rainbow cake. If I use gel food coloring will this vanilla cake still work? Best cake ever. Made numerous times. My tips would be always line tin with paper & freeze before leveling & icing. My 2 sons are obsessed with this cake. I recently found your site and am so impressed with your cakes and decorating skills! I have read many of the comments regarding this cake because I have been searching for my favorite “white” cake for soooo long. I can make a “vanilla” cake, but to me, they often taste too buttery, or I say, like a buttermilk pancake. I am looking for a white cake recipe, that won’t taste buttery or too much like vanilla. I have used a boxed mix (white, then added a bunch of ingredients), but I prefer scratch. I am fine with egg whites only, as I use the yolks in homemade lemon curd. I am hoping to find a great white cake recipe that I can pair with my homemade raspberry puree and lemon curds. Do you think this might be it? Also, I see that you use 3 8″ rounds. Can you give me a guess as the the height of your layers? I love tall cakes!! Thanks so much!! You could certainly try this cake and see. I’m sure it’s a bit of a preference thing. There’s also the cake layers of this cake, which I tend to think are more white. Generally the layers are around an 1 inch or so each. I hope you find one you love! Yes, I saw your earlier comment. I feel like the layers are normally a little more than 1 inch for all of them, but I don’t actually measure them. You might want to try them out. You could also use 1 1/2 of the recipe and possibly make 9 inch cakes. For the powdered sugar, the standard decorators buttercream (which is what I use), uses a ratio of 4 cups of powdered sugar to 1 cup of butter (or butter and shortening, in this case). You can always reduce the amounts though, if you prefer. I see the recipe for the vanilla buttercream icing. Will this be enough to cover this cake? The frosting recipe listed with this cake is the amount I’d recommend. You could reduce it if you like. Hi Lindsay!!! Thank you for this recipe!! Tried this recipe and the cake tasted great! Although, one thing I would recommend is to use less baking soda, using what the recipe says makes a denser cake and makes the batter almost like cookie dough. The end result almost tasted like cornbread, but with a little frosting I was able to save it and it tasted delightful! The recipe says 12 cups sugar for the icing, but the instructions say 6. What is the correct measurement? 6 cups are added at first, then the remaining cups are added a couple steps later. Can you let me know how pink icing is done? Did you add food color? Thank you for helping me! You add pink gel icing color. It’s available most craft stores and Walmart. 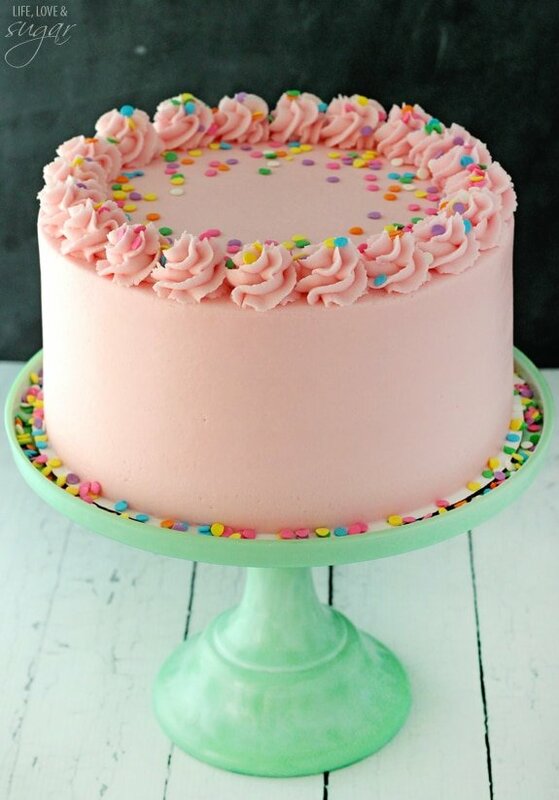 I added a quarter cup of rainbow sprinkles with the last bit of flour I poured in for a homemade funfetti and used your smooth buttercream icing tutorial for my daughter’s birthday party and the cake was beautiful and delicious! Everyone thought i bought it! Thank you so much! Perfect! So glad everyone enjoyed it! I’m going to make this cake for my son’s birthday – I have 9 inch round cake pans. Do you know how long to bake for, or how to adjust the recipe for 9 inch pan? I’m not totally sure. If you are baking two layers though, the baking time should be relatively similar. DELICIOUS! I’ve made this several times now and had it requested for birthdays. I’ve made it just as written, as cupcakes and most recently in 1/2 a sheet pan (not a 9 x 13). I was a bit worried about the cooking time but in my oven it took just 30 minutes. The recipe is easy to follow and comes out perfect every time. Thanks for sharing! So glad to hear it’s worked so well! Hello! I have made this recipe for birthday parties 7 times and every time it has been a HUGE hit. I want to adapt it to a sheet cake. Terri May – can you tell me if you had to double the recipe? My pan is 11×15. Thank you! Hello, just curious about your measurements on the powdered sugar for the icing, it says 12 cups 1380grams well that don’t add up, I used 8 cups instead and I’m in a diabetic shock. I’m just confused about that. And I used buttermilk in the cake batter instead of milk and the cake is fabulous! The math is correct. 115g per cup is 1380g for 12 cups. It is quite a bit of powdered sugar, but it’s a standard amount for a decorator’s buttercream. You can certainly reduce it, as you did, and have just fine results. Feel free to check out my post on frosting consistency. Glad you enjoyed the cake! I’ve been trying to find a great vanilla recipe for a while. This is absolutely the best vanilla cake ive ever had. I made for my cousins birthday and everyone loved it. It wasn’t heavy at all. Extreamly light and fluffy. This recipe is defiantly a keeper. Thanks Leanne! It’s been a while since I baked this particular cake, but I think I used it under fondant before. It’s very hard for me to say from a distance. Did you fully cream the butter and sugar? Did you happen to open the oven during baking/too soon? The taste of this cake was wonderful! But it was so moist that it was crumbling and falling apart just taking it out of the tins. ???? I made it in 8″ and 10″ tins, for a 2-tiered cake, and quickly realized after baking, cooling, and removing from the tins that there was no way it would hold up. We ate the broken pieces as snacks and I switched recipes! Hmm, it’s definitely moist and tender, but it should be workable. I actually just baked it yesterday and split it into 6 thin layers and it was fine. Did you put parchment paper in the bottom of the cake pans to help them come out more easily? Also I like to use a cake lifter to help move around large or fragile layers of cake so they don’t fall apart. Yes to the parchment paper on the bottom of the tins. And I used a Wilton cake lifter, as well. They really were tasty! And they definitely were cooked completely, based on the crumb test and I also measured the internal temperature. Well, bummer! Sorry you still had trouble with it! Hi Lindsay- this recipe is fantastic. I have made it numerous times for birthdays and other occasions. Everyone always raves about it, and I’ve experimented with swapping vanilla extract for almond extract, which turned out great as well. I was wondering if you’d ever tried adding chocolate chips to the batter. Do you think it would change the baking time if I tried it? I’d love to hear your opinion before I use all the ingredients and make it, only to have it flop. Thanks! I’m so glad you’ve enjoyed it! I haven’t tried adding chocolate chips before. It shouldn’t need any adjustments to baking time, but the question is whether they’d sink to the bottom of the pans when baking or not. I don’t think they would, but I’m not certain. Do you think i can bake it all at once in the same 8-icnh pan? No, that likely won’t turn out well. The pan might overflow and even if it didn’t, it wouldn’t bake evenly. You’ll want to use at least two pans. Lindsay, I am wondering if you actually weighed the ingredients that you used, instead of just converting the measurements to metric using the internet? If you did the latter, then that might explain why some people are having bad results. I just measured my sugar using cups and then weighed it and it was well under 446 grams. You really need to weigh the particular amount of ingredients you used in order to give accurate volume measurements; your ingredient weights could be more or less, depending on whether the flour was sifted or not, whether you used granulated vs. castor sugar, etc. If that is in fact what you did, then I apologize, I am only trying to help troubleshoot. All the best! I actually weigh all of my dry ingredients, so it’s all accurate. I’ve recently made this cake about 10 times for various reasons (all dry ingredients weighed) and it comes out great every time. Thanks! If I wanted to marble this with your chocolate cake recipe can I bake this at 300? The chocolate cake and vanilla cake have different batter consistencies, so they would not bake together well. I would recommend my Marble Cake. Thanks for sharing this amazing recipe. 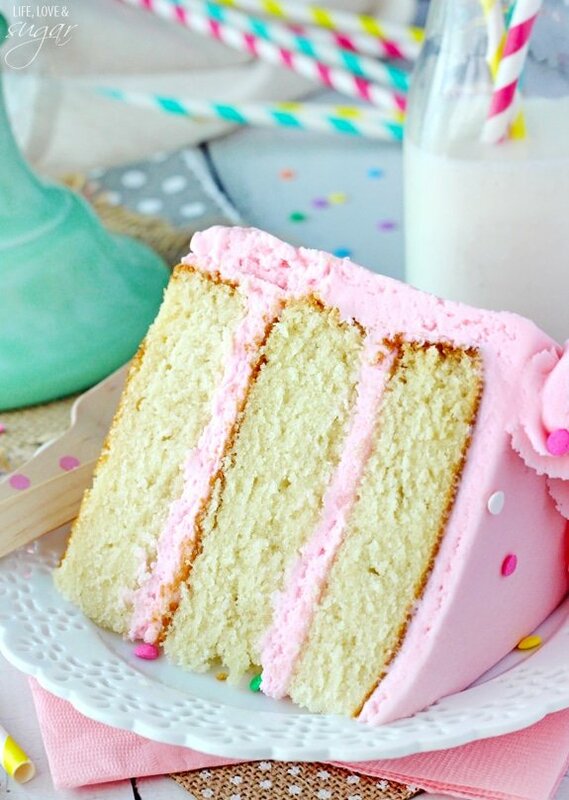 I’ve been looking for a perfect vanilla cake, and this is it! I baked it twice today and both results were excellent. Yes, yes, very moist and fluffy (not just a named. My first batch in 3, 8 inch pan, baked perfectly for 30 mins. Next time I will probably take them out at 28 mins., though the little crust that resulted was amazing to snack on! I baked the second batch using 2, 10” cake pans for just 20 mins. I will check my cake 2 or 3 mins before, but still came out delicious. From this batter I also made 10 mini cupcakes to keep the kids away from the cake for now. These only required 11 minutes at 350 degrees. Love, love, love this recipe. Thank you ????????!! That’s awesome you make cupcakes as well. I’m so glad you enjoyed! Hi, I was wondering if I could use vanilla almond milk instead of regular milk? THANKS. I haven’t used that myself, but I don’t see why it wouldn’t be okay. hey Lindsay! I’ve never used shortening in anything before, let alone the icing I’m just curious if has anany taste and or if it adds any kind of taste to the icing, also wondering if I would be able to safely replace the shortening with something else like maybe coconut oil or something? I’ve just never used shortening before. I followed the recipe exactly and ended up with a greasy cake that wouldn’t stay together and sunk in the middle. Will not use this one again. I made this cake for my daughters 1st birthday (decorated it unicorn style) and everyone said how amazing it tasted. I’m so pleased and can not wait to try your other recipes!!! Just made this cake for my daughter’s 1st birthday and it was absolutely Amazing!!! Everyone couldn’t stop eating it! I’m making it again for a party next week but Serving with fresh whipped cream and berries! Thank you!!! I’m so glad you enjoyed it! Thanks Amy! I made this cake on today. After reviewing the recipe and reading the comments I made the following changes. I used 1 1/2 tablespoons of vanilla bean paste, 1 cup of buttermilk and 1/2 cup of milk and 1/8 teaspoon of pink Himalayan salt. The cake was moist, flavorful and delicious. Thank you for an AWESOME base of a recipe. Love this recipe!!! I set a timer while mixing the vanilla and everything, Felt like cooking with my grandma! I mean that as the highest compliment! My husband walked in and asked what I was doing and when I said “following directions to my his delicious cake!” He chuckled and said “you never follow directions” ???? this one was fun and easy! Cakes in the oven now but the batter was so good the kids and I almost wanted to just eat the whole bowl! Thanks for sharing!! Slightly crispy exterior, reminiscent of corn bread. Not bad, just not quite as advertised. I hate to say it, but this cake was horrible! Came out of the oven properly and was perfectly done but the taste and texture were awful. Everyone thought it tasted like cornbread (now I’m seeing other similar comments like this). Such a waste of all organic ingredients and time!! I’ve never made a cake that people didn’t like and we ended up throwing it out. Such a disappointment since it was for a special occasion. I know better now to stick to professional, tested recipes. I hate to post negative comments but just want to warn others so they don’t make the same mistake. I plan on trying this out for my daughters birthday in a couple months. I had two questions if you made this as a bottom for a two tier cake what round size would you use for the top tier? With that I currently live at a high altitude would you add anything to help keep the cake moist things tend to cook faster and dry out a little faster during cooking. I would think you could use just about any size that was smaller. Perhaps a 5 inch top with an 8 inch bottom would be best. I really don’t know much about high altitude baking, I’m sorry. How high would you say this cake is when made with the 8 inch pan and three layers? I’m not sure, I haven’t measured the cake before. Have made this a few times and it always comes out great! My question is, I use your method to get the smooth frosting. But for some reason it always settles quickly and I can see the rings around the outside of the cake where the layers of frosting inside are. Is there any way to get rid of this? Would it be okay if I used Lactose free milk? I haven’t ever tried it, but imagine it would be ok.
Hello Lindsay. I absolutely love your blog an those wonderful recipes. There are just a few things that are difficult to buy here in Europe as shortening. Is there a substitute for shortening? Butter can be used as a substitute for shortening. Hello, What happened to the recipe? i don’t see it anymore. I’m sad to say it but this cake was pretty bad. It tasted kind of like cornbread. It looked really good and was cooked nicely but it still was bad. I used a store bought frosting and that made it a little better. Gosh, hard to describe and I think preference really depends on the person. But I do think this cake has a tighter crumb than the Moist Vanilla Cake. If I had to guess, I’m thinking you’d probably prefer that one.